The popular Spa country towns of Daylesford and Hepburn Springs in Victoria are perfect for romantic getaways. As the hot days of summer recede, the streets are coloured in russet reds and golden yellows, and mist hangs across the valleys in the morning. The trip from Melbourne to Hepburn Springs only takes one hour 40 minutes. Romantic getaways in Hepburn Springs and Daylesford, particularly in the cooler weather are all about luxury, pampering and enjoying the natural beauty of the area. 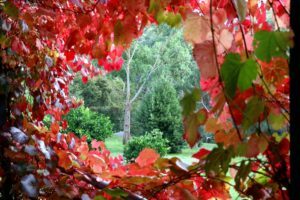 Here is our selection of the best things to do in Hepburn Springs to make your romantic getaway perfect. Romantic getaways in Hepburn Springs and Daylesford are about appreciating the natural beauty of the area. The rocky, gentle mountain landscape – responsible for bringing healing mineral waters to the earth’s surface in Hepburn Mineral Springs Reserve – provides the perfect landscape and climate for mediterranean style gardens. A visit to Lavandula is one of our favourite things to do in Hepburn Springs and is beautiful at any time of year. Lavandula is located five minutes from Hepburn Springs and is a working lavender farm, that also sells a range of lavender and other botanical products. Lavandula was established by Swiss Italians, who settled widely in the area in the 1850s. The entrance to Lavandula across a swing bridge over Jim Crow Creek will immediately impress all die hard romantics. This rustic, historic property is perfect for exploration and has an abundance of photo opportunities. Wander through produce gardens, lavender fields and fruit orchards. Take a tour of the historic stone buildings and have lunch in the rustic, timber restaurant, La Trattoria, which serves fresh produce from the garden. 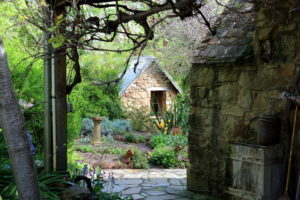 Other romantic gardens to explore include Wombat Hill Botanical Gardens in Daylesford, established in 1863. A circuit of Lake Daylesford provides beautiful views across the lake and abundant birdlife. At the end of your journey, enjoy a coffee, hot chocolate or lunch at the cafe overlooking the lake, before browsing in the secondhand book shop next door. If you love walking in nature, there are plenty of walks to share together on your romantic weekend escape. Hepburn Springs is surrounded by the Wombat State Forest, full of tracks through rocky landscapes filled with grey gum and meandering creeks. There are also numerous lookouts providing extensive views across central Victoria. Start your walk from Golden Springs Avenue in Hepburn Springs and walk along the Dry Diggings track. Left will take you to picturesque Breakneck Gorge. Right will take you on a shorter walk to Jacksons Lookout. For an intimate dinner, there are several Daylesford and Hepburn Springs restaurants to choose from. In Hepburn Springs, nothing surpasses the elegance and romance of The Argus. This renovated art deco building serves contemporary cuisine and is a Chefs Hat award winning restaurant. The food is high quality, the decor is beautiful, and the service is also very friendly. See our review of The Argus restaurant. The Lakehouse restaurant in Daylesford is another option for a romantic dinner. The Lakehouse has been running for many years and is also a Chefs Hat award winning restaurant. Much of the food is sourced locally or grown onsite in the gardens. For some serious relaxation and body pampering on your romantic getaway, you can’t go past combining hot mineral springs bathing with a couples massage. The famous and historic Hepburn Bathhouse is located in Mineral Springs Reserve in Hepburn Springs. Mineral springs bathing and a range of body therapies are also available at The Mineral Spa in Hepburn Springs. See our review of Hepburn day spas and massage. For most people romantic accommodation needs to provide seclusion, comfort, luxury linen, a large spa bath and an open fire. Include a two acre private garden with herb garden, roses, grape vine and fruit orchard, and a house full of antiques, and you’re describing Kookaburra Ridge. Kookaburra Ridge will exceed all expectations for romantic accommodation in Hepburn Springs. This beautiful double storey country house has an established, mediterranean style garden for exploring throughout the year. Autumn and winter are perfect for cuddling up on the lounge by the open fire with a glass of wine and a huge basket of wood. Outside an enormous grape vine sheds its bright crimson leaves over the deck. The olive trees are abundant with fruit and the camellias are bursting into flower. Couples can enjoy cooking together in the antique kitchen, or simply relax in the huge spa bath overlooking the herb gardens. For those looking for accommodation in Hepburn Springs that provides an unsurpassed experience of beauty, privacy and luxury, Kookaburra Ridge is the perfect place to shun the world for a weekend or few days.